Pitching in the postseason is a different beast. The pressure is jacked up, all eyes are fixated on the mound; every pitch thrown could be the one that either gets you through to the next game and on to the next series, or the pitch that sends your team home early. Whether it’s Game 7 of the World Series or the first round of a company slow-pitch softball league, this pressure can be daunting. Take it from me, the guy who walked 4 people in a row including the tying run for my softball team just three days ago to eliminate us (don’t ask… I don’t wanna talk about it…). 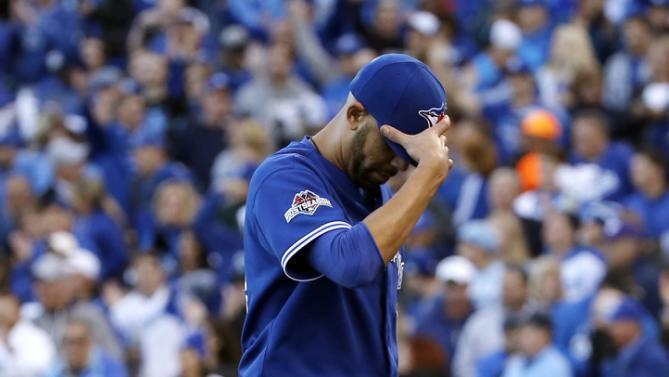 Toronto’s David Price knows this struggle all too well. With the Toronto Blue Jays beating the Kansas City Royals yesterday 7-1, the Jay’s ace will be handed the ball in Game 6 tonight with Toronto’s World Series hopes on the line. Normally sending an AL CY Young candidate to the hill in a must-win game is the best case scenario, but throughout his career Price has not looked like Price once the calendar has switched to October. In 7 postseason starts, Price is a head-shaking 0-7 with a 5.12 ERA. In two starts and three innings of relief this postseason he is 0-2 with a 6.75 ERA. It’s amazing to think this is the same player who pitched to an 18-5 record during the regular season, and an almost perfect 9-1 with a 2.30 ERA in 11 starts since becoming a member of the Blue Jays at the trade deadline. Price looked as though he would finally get this monkey of his back in his last start in Game 2 of the ALCS. He sailed through 6 innings, giving up a leadoff single in the first and promptly retiring the next 18 batter he faced. He looked like his vintage self, throwing hard and commanding the inner half of the plate while throwing a devastating change-up that shut down the Royals’ hitters. But in the 7th inning, it seems Price’s postseason demons reared their ugly head yet again. After a misplayed pop-up in right field, the Royals were able to piece together a five-run inning on their way to a 6-3 victory and Price’s 7th postseason loss in a row, tying him with Randy Johnson for the most consecutive playoff losses in MLB history. And despite his playoff history, he should be confident. At the end of the day, he is a dominant pitcher with a Cy Young to his name and the backing of the best line-up in baseball behind him. The team has confidence in him, the manager believes in him, and every Blue Jays’ fan wants him on the mound in this potential elimination game. This is what Toronto acquired him for, for games just like this one, but it is up to Price to live up to his full billing. Price is not alone when it comes to great pitchers having their struggles in October. Just ask the best pitcher in the world Clayton Kershaw. The 3-time NL CY Young winner came into this year’s postseason with a 1-5 record and a 5.53 ERA in his playoff career before rebounding with a 2.34 ERA in 2015. Jake Peavy, another former Cy Young winner, also went 1-5 record with a 7.98 ERA, while ‘Big Game’ James Shields is 3-6 with a 5.46 ERA. Looking back further, Hall of Famer Greg Maddox was 11-14 in the postseason while fellow teammate and Hall of Famer Tom Glavine was 14-16 while the Braves were off winning 14 straight division titles. All of these guys are great pitchers, and yet all had some degree of postseason under-performance or disappointment. Fortunately, Price still has time to avoid ending up on the same list. He will get his next, and arguably most important, chance to flip the narrative tonight as he and the Blue Jays head to Kansas City to take on Royals’ starter Yordano Ventura in Game 6. It is there, with the bright lights on and elimination staring him and the Jays in the face, where we will learn what Price is made of. If he goes out and shuts down this potent Royals line-up to force a Game 7 it will go a long way to erasing his reputation as a playoff flop. However, if he pitches to his postseason numbers and Toronto is eliminated, many will rightfully point to him as the reason why, further cementing his dismal postseason legacy. We will find out tonight if he can.